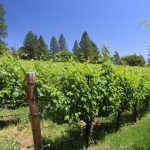 California’s most famous wine region, Napa Valley beckons oenophiles and outdoor enthusiasts alike due to the beautiful landscapes and year round temperate climate, not to mention world renowned wines. It’s also relatively accessible due to two major airports within a sixty to ninety minute drive of the Valley. 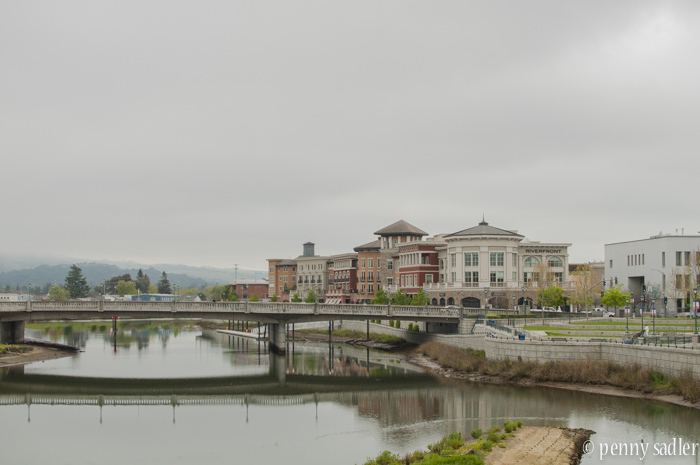 For visitors who would like to avoid a holiday spent driving, downtown Napa City is the perfect stopping off point. You may recall that in August 2014 Napa experienced a major serious earthquake. While there was some serious damage the city is currently experiencing a full blown renaissance. I think this really speaks to the strong sense of place that Napa exhibits. It’s a tight community dedicated to a way of life that is quite simply, a really good life. Just to be clear, Napa is a city in Napa Valley. If you’ve never been there before this is an important distinction. You can of course visit Napa Valley and bypass the city of Napa but that would be a mistake. 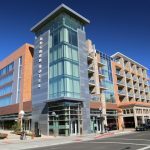 Downtown Napa is booming, and has so much to offer you’ll have a tough time narrowing down your choices. 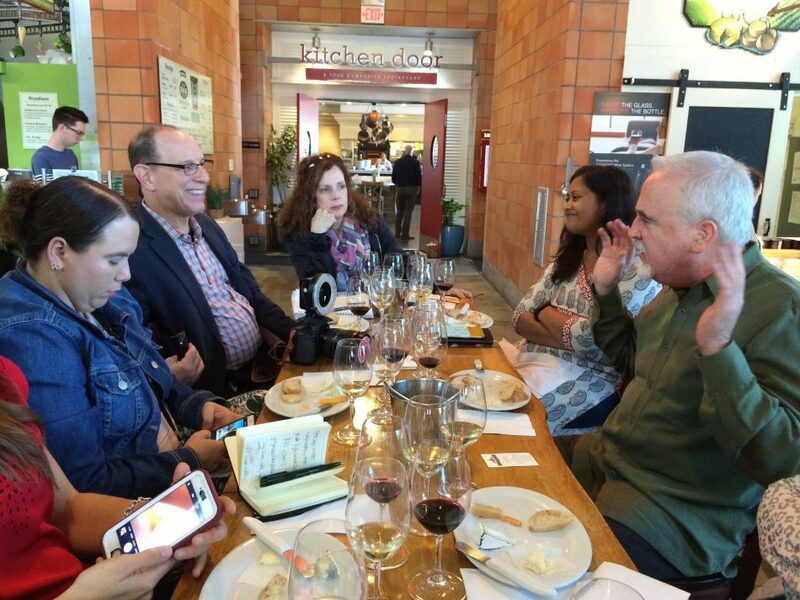 Wine is the defining element of Napa Valley, but you could have a great time in Napa even if you don’t drink. There’s a thriving art scene, great restaurants, boutique shopping, interesting turn of the century architecture (there are more Victorian buildings than any other city in the Bay Area) and culture galore. If you prefer more active vacations, Napa is a great place for an outdoor adventure. 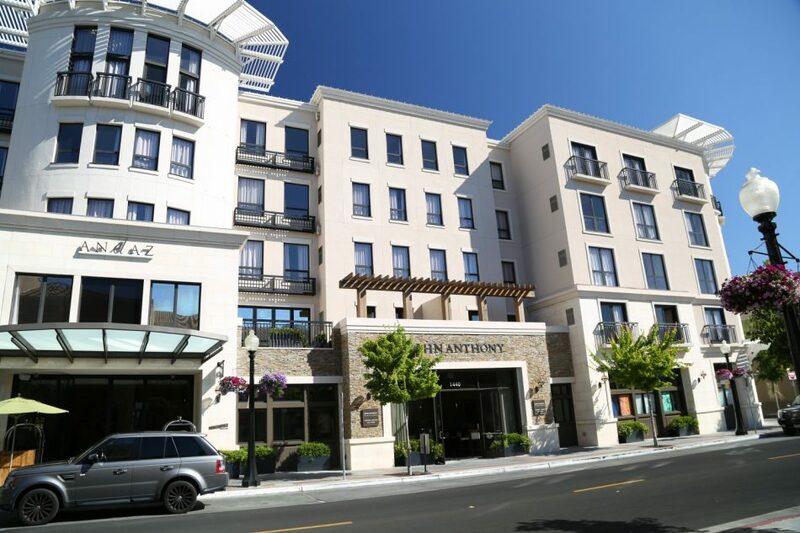 From family style suites to historic rooms on the Napa River, there’s an accommodation to suite your style in downtown Napa. 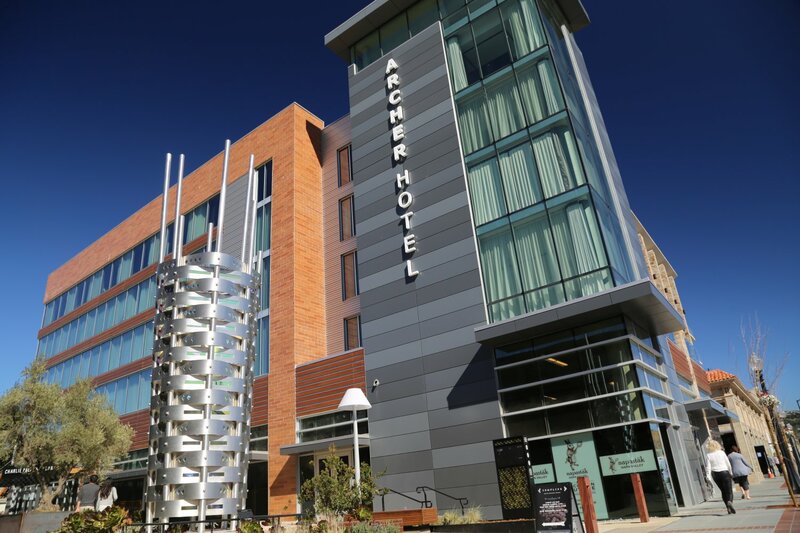 A boutique luxury hotel with 141 rooms, wine suites for events or business meetings, bike rentals, access to a full service spa and fitness facility, terrace with a fire pit for chilly Valley nights, the Andaz Napa is a good choice for the guest who likes lots of activity and a more urban environment. There’s no dedicated reception area; instead you just walk right into the lobby which doubles as lounge, wine bar, entertainment venue and check in. 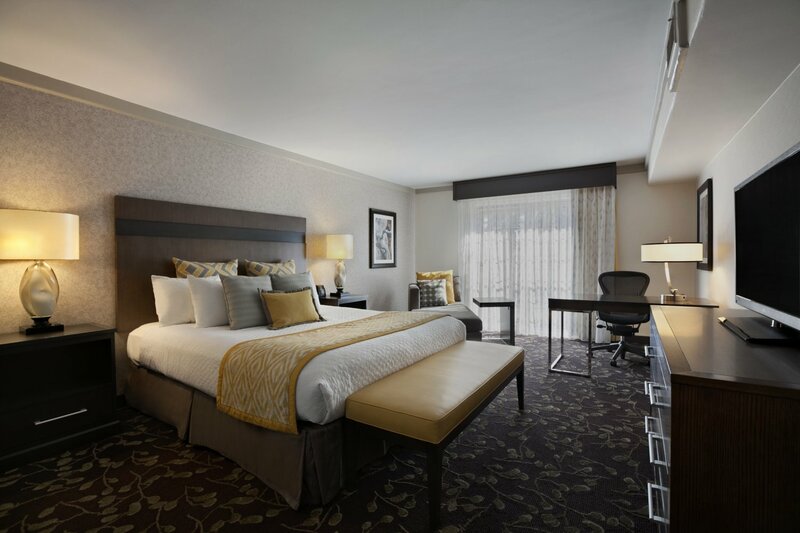 The standard rooms feature elegant attention to detail and lots of luxurious and techie extras that make for a memorable weekend. I especially liked the Geneva docking station, the remote controlled fireplace, and modern design elements like hardwood floors and a clean color palette. 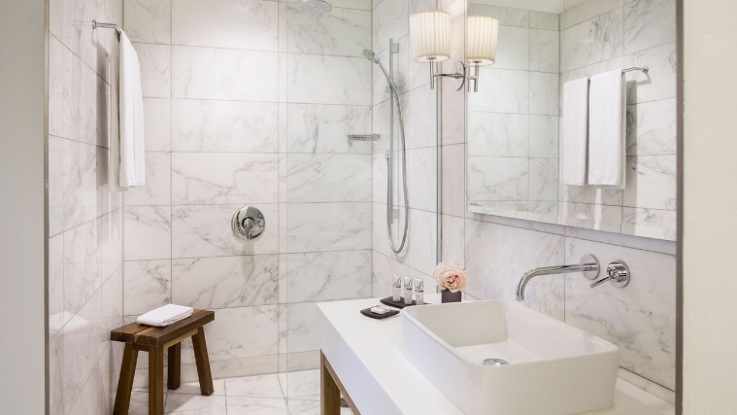 If you’re sharing a room, you will appreciate the convenience of the double sink in the bathroom. I loved the huge walk-in shower and the ensuite bath tub. Imagine having a nice relaxing soak and then crawling into bed. Extras like bottled water, snacks and high speed internet access along with the usual amenities are included in your room rate. There are no hidden fees or surprises upon check out. Wake up to breakfast and communal style dining at the Andaz Farmer’s Table. Fresh local food is served in comfortably chic rustic environment, where you can be as social as you like, or not. The Barista Bar offers coffees, teas, juices and grab and go food items. Insider tip: If you prefer a more serene environment be sure to take a room on the side of the hotel opposite the outdoor terrace. 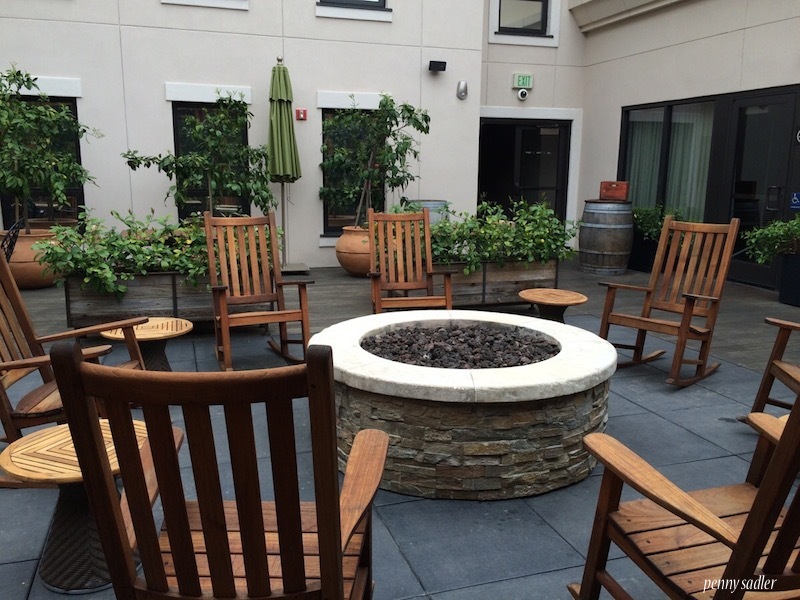 There’s a lovely fire pit with plenty of comfortable seating so this is a popular lounging area for hotel guests. The bar there stays open until 11:00 pm which can be bit late if you have an early morning call time or if you’re simply an early to bed guy, or girl. 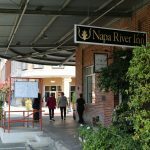 For the guest who enjoys a sense of place a stay at the historic Napa River Inn, located on the riverfront since 1884 may be just the ticket. The original building was once an old mill and the rooms located in this building retain some charming architectural elements: hardwood floors, exposed brick, and beautiful old windows, updated of course. 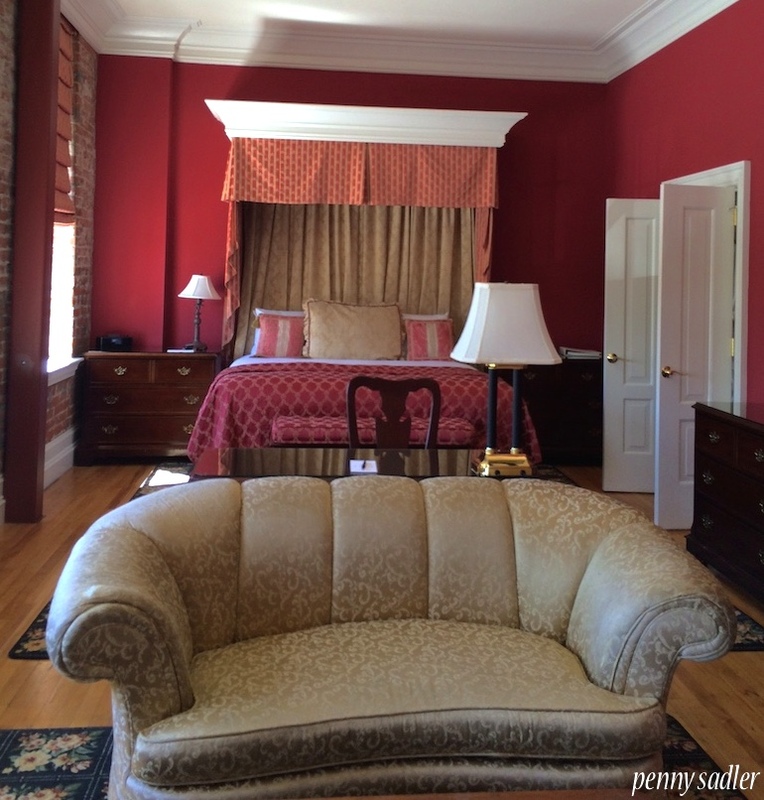 There are seven rooms including the Captain Hatt suite, named after the original owner. Some of these rooms are said to be haunted though the day we visited there were no signs of spirits. I’m sure we were way to noisy! There are two other buildings separate from the old hotel – the Plaza and Embarcadero Buildings have standard and deluxe suites along the river front. Deluxe rooms come with a river view and balcony. 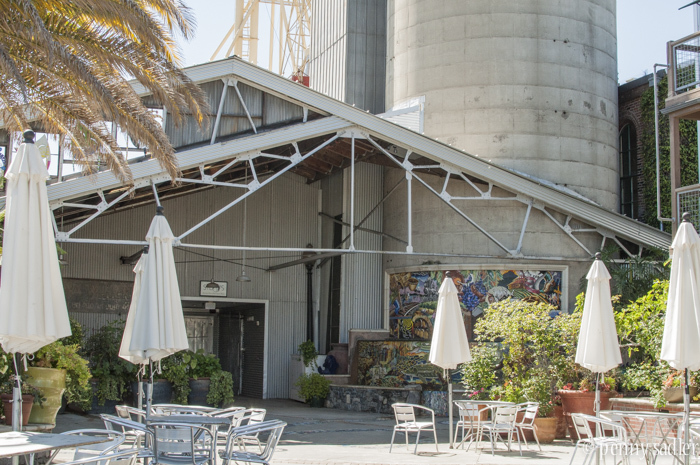 The Napa Mill complex has everything a visitor could want for an evening or two within a stone’s throw. 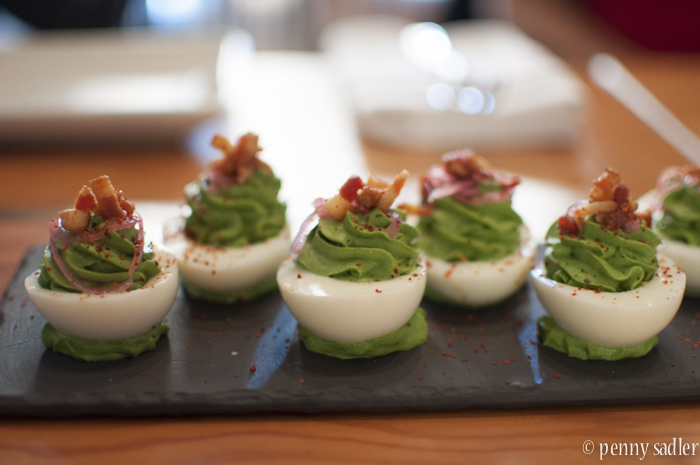 Fine dining at Angele or Celadon, a sweet shop, the Napa General Store, and Silo’s nightclub with live entertainment. Talk about convenient! 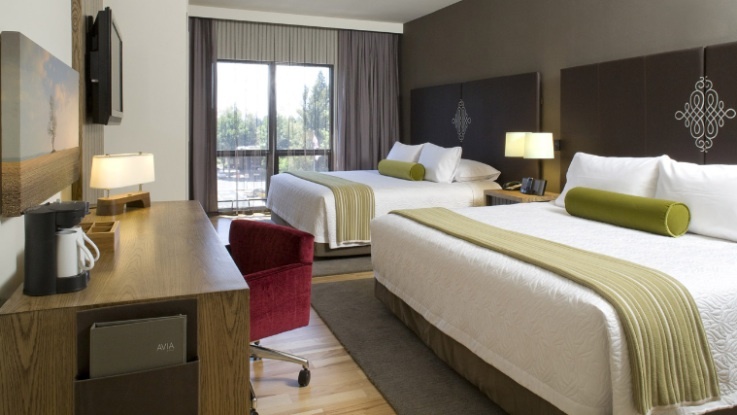 Larger groups seeking family friendly options may find the Embassy Suites more convenient. The Embassy Suites is located within a mile of downtown Napa City. An in room mini-fridge, free daily breakfast and hotel fitness facilities make this a great choice for those who need a comfortable and convenient place to stay without all the frills. I hope you’re planning on eating while you’re in the Napa Valley because the city of Napa is one of the premier dining spots in the valley. From ethnic to California favorites like fish tacos, everything is fresh and thoughtfully prepared with ingredients that are as local as you can get. For breakfast a local favorite is Model Bakery, conveniently located right next to the Oxbow Public Market. Plan to get in line early. 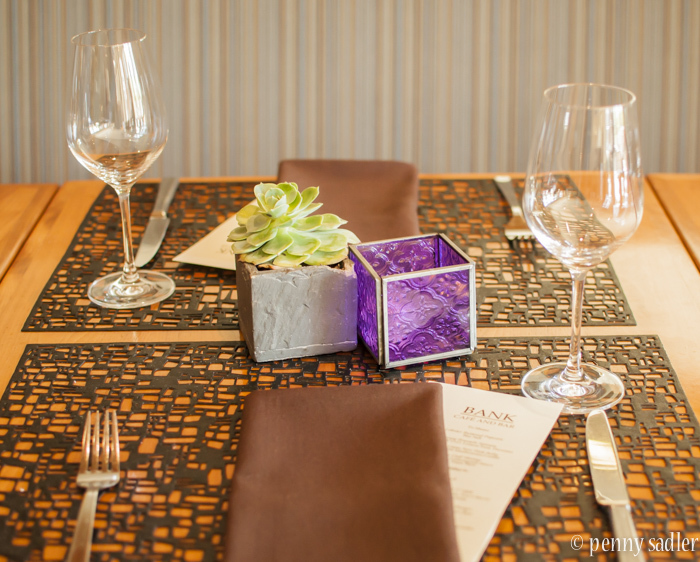 An elegant lunch choice, Bank Cafe and Bar located at the Westin Hotel along the river is a great choice. The menu is designed by Michelin Chef Ken Frank. Share some starters like Lobster Buttered Popcorn with Bay Salt or Crispy Brussel sprouts with pinenut, E.V.O.O Lemon Zest and Pecorino. 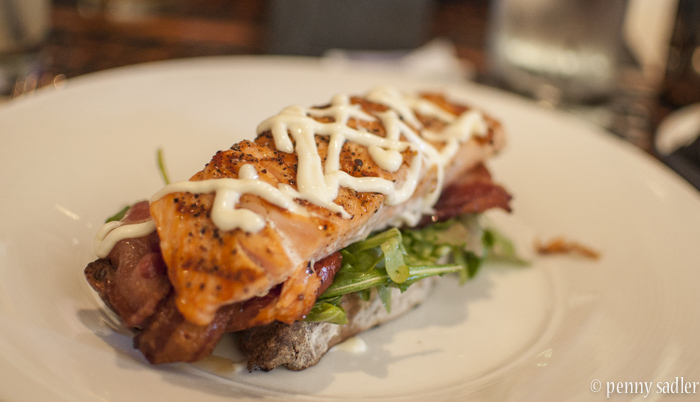 For lunch I had the Skuna Bay Salmon “BLT” style with roasted tomatoes, wild arugula, Zoe’s bacon, lemon aioli, and grilled ciabatta. Be sure to work up an appetite for dinner – there are over sixty-five restaurants in downtown Napa. Seriously, I can not stop thinking about all the delicious meals I had in just thirty-six short hours! 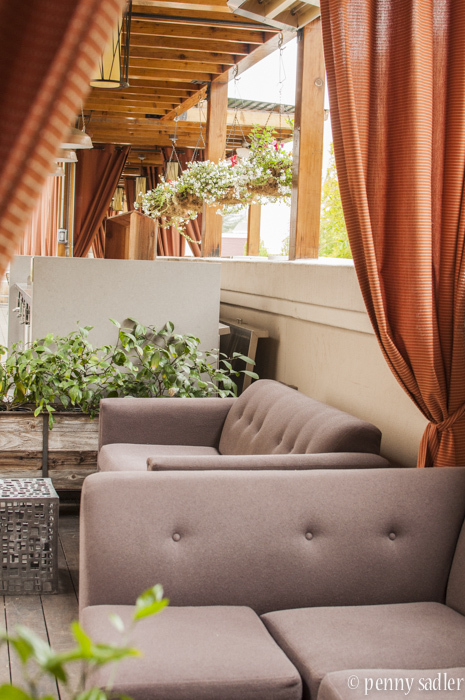 Torc is relatively new to the Napa Valley restaurant scene but owner Sean O’Toole has an impressive resume and is certainly not a newcomer to fine food and dining. We stopped there for the amazing happy hour and wines by the glass for six dollars! You read it correctly. We tried a series of small dishes: deviled eggs with bacon, roasted cashews, and sweet potato pakora with yogurt-truffle dipping sauce. 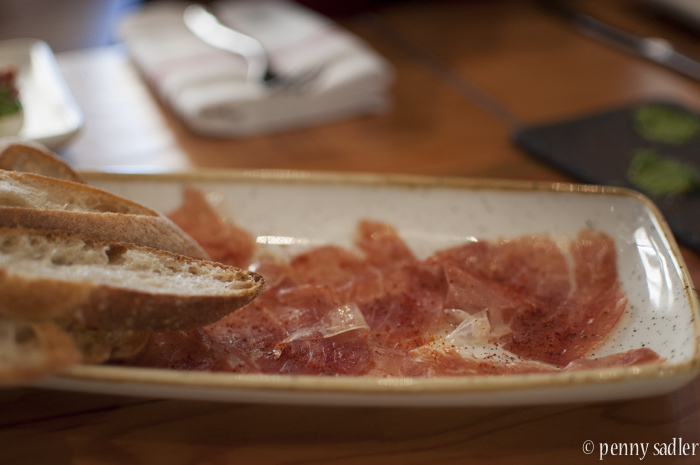 If they have it on the menu order the jamon. It was so good I thought I was back in Spain. The wine pairings were as expected, spot on. Angele is located on the Napa River in an old boat house. The bright blue door beckoned us to come inside but there is also outdoor seating. 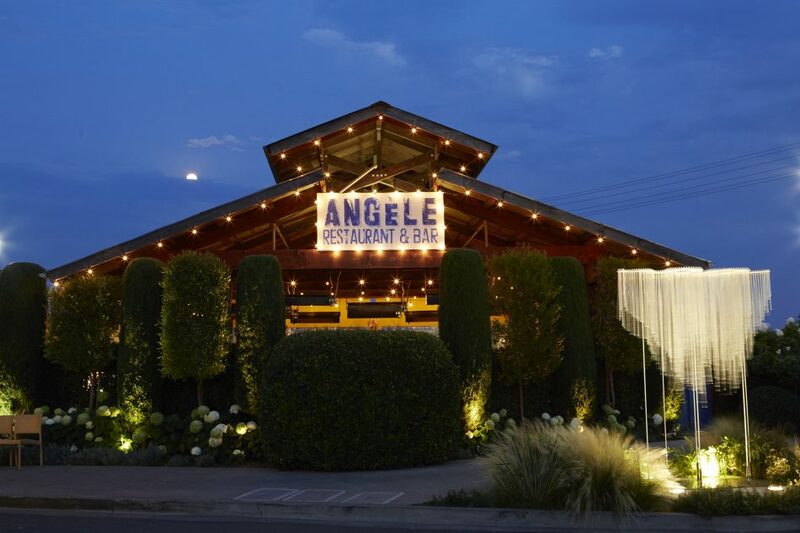 Named for the owner, Angele has been serving country french cuisine in Napa for 14 years. They are definitely doing a lot of things right. 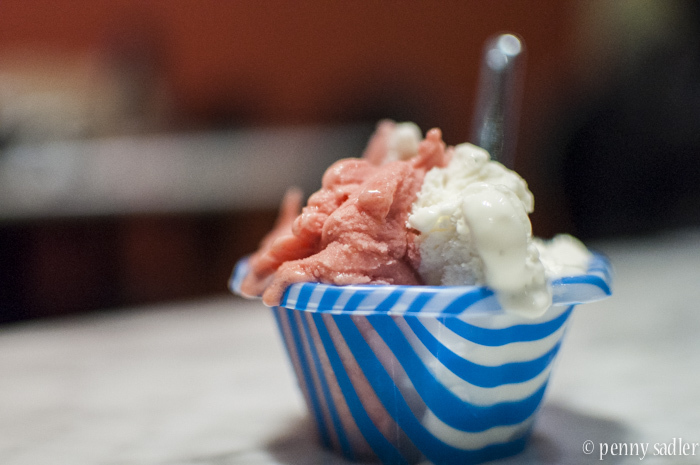 For dessert, or an afternoon snack, or whenever you feel like it, do not miss Frati Gelato Cafe. Owner Anthony LuPriore is a second generation Italian American who spent thirty years living in Italy. 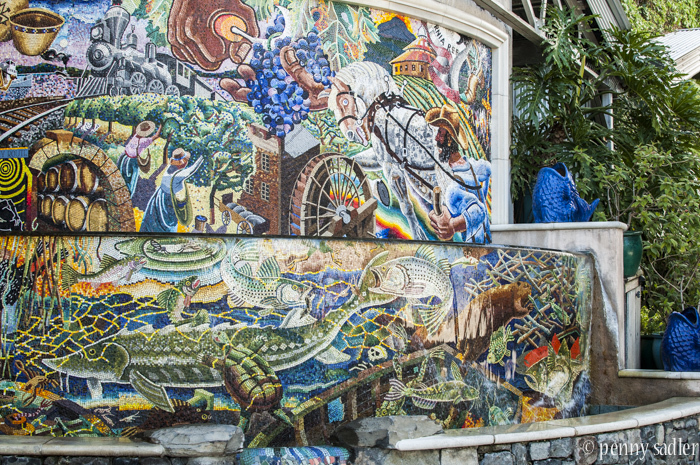 When he returned to California he decided to create his own slice of Italy for all to enjoy. Every day he makes fresh gelato just like they do in Italy. 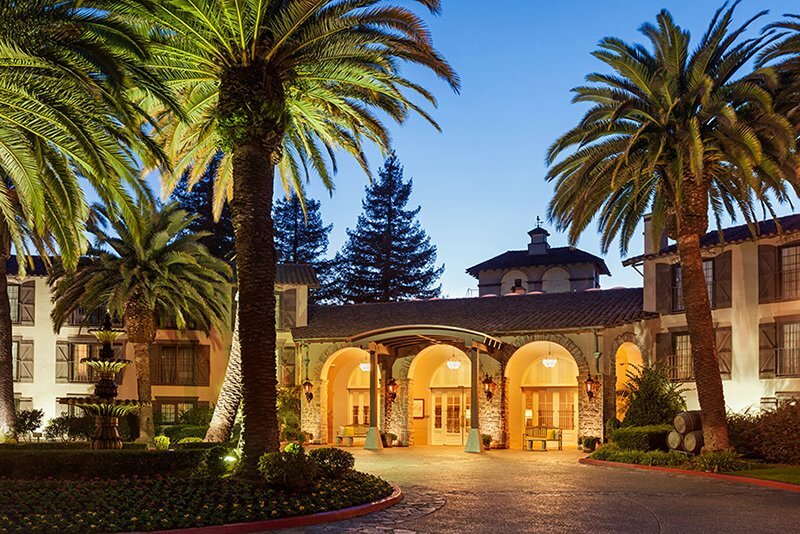 Savor la dolce vita along the Napa River. 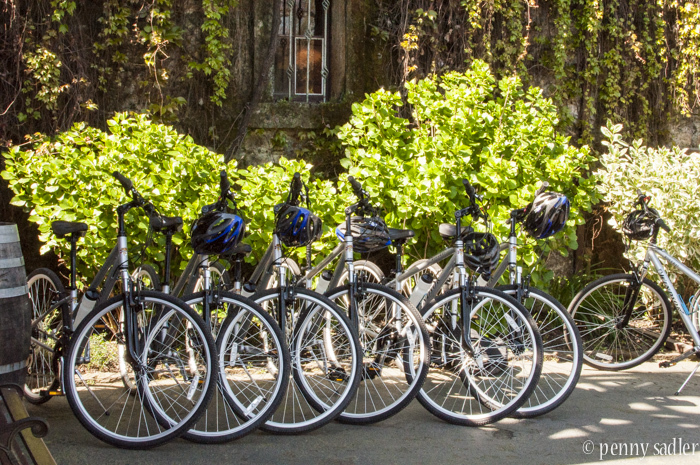 The really big news for bikers is the Napa Valley Vine Trail. Eventually, this trail will connect the entire Valley from south to north. 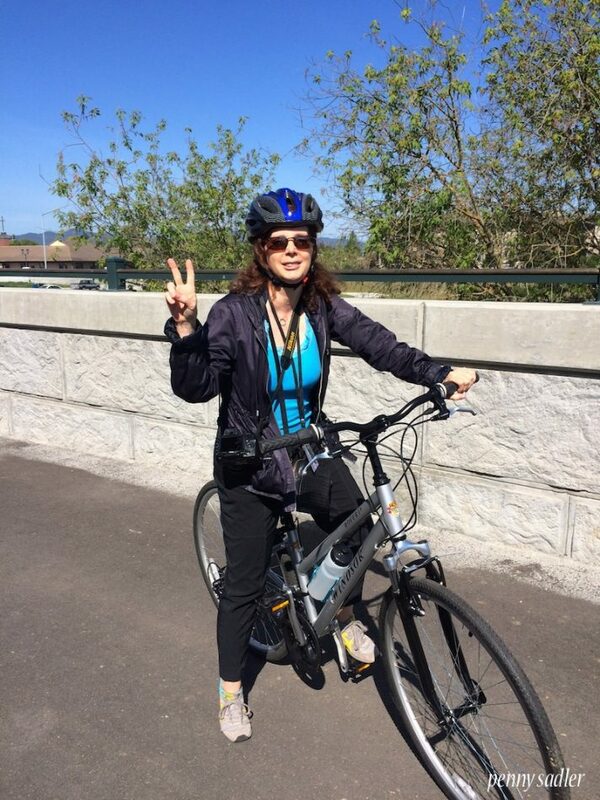 Your truly on a bicycle for the first time in 10 years! It was fun! I do love local markets however, and almost always take home something purchased at a local market to savor later. Oxbow Public Market located along the Napa River is the place to discover local farmers and producers dedicated to supporting the sustainable movement in Napa Valley. 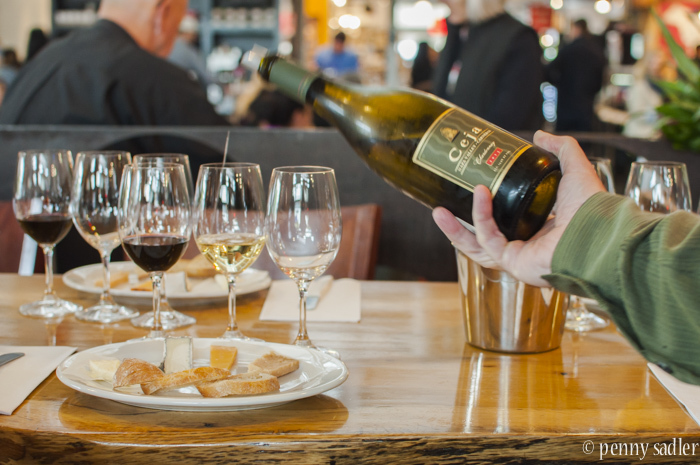 You’ll find artisan spirits, fresh flowers, local olive oils, ice cream, books, coffee and of course wine. 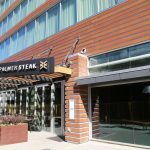 There are also several restaurants serving everything from oysters to fish tacos. If you go for lunch get there early, it’s crowded and the locals love it too. 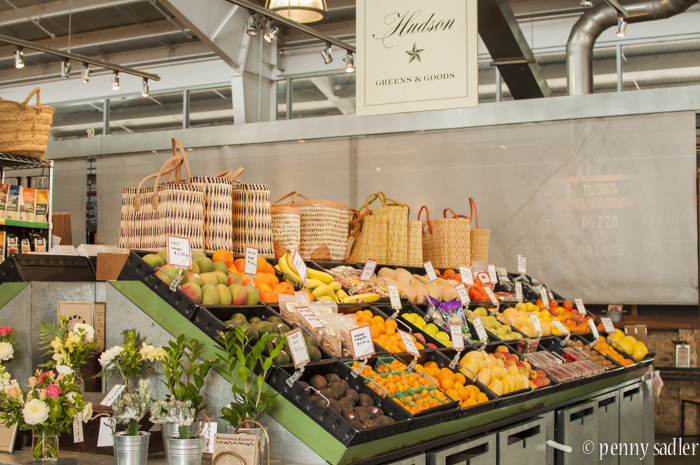 The market is open daily from 7:30 am to 9:30 pm. Insider tip: There’s a nice organic juice bar at the market for those who wish to stay healthy or at least balance their wine consumption with a bit of detoxing. Insider tip: The selection of wines is excellent here. It’s a great place to get a little history of the area and the vineyards too. When you go, fly into San Francisco International Airport or Oakland International Airport. From either airport you can rent a car or use Evans Airport Shuttle. The Evans airporter is only $29 dollars each way and drops you about 10 minutes north of downtown (once you arrive you will need to use Uber or call a taxi). 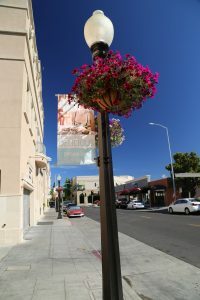 My trip to Napa City was sponsored by Downtown Napa. All content and editorial opinions are my own. Penny, fun stuff, and since I haven’t been in downtown Napa in a while, many things were new to me. Haven’t been on a bike in 10 years, eh? Probably because that was wine in that bike bottle, and it’s safer walking. Thanks for the tour—have to get out there again myself soon. Actually, Yes, Napa has a lot going on. Very enjoyable place. 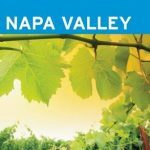 And I’ll meet you both there to offer some exceptional insights into some of Napa’s most little known yet prestigious mostly hillside located wineries. Damn, those are BOTH good offers! I will encourage fate, time and space and calendrical symmetry to make this happen.